For flight cancellations with prior notices of up to 14 days or more in advance, the airline is exempt from paying any compensation. Should there be any occurrence or extraordinary circumstances such as a strike or general grounding, the airline is also exempt from paying any compensations as these conditions are beyond their control. What are my rights in the event of a flight cancellation? What compensation can I get for a cancelled flight? The EU Passenger Rights Regulation entitles you to a full reimbursement of the ticket price, or alternative transportation. If you were informed of the flight cancellation less than 14 days prior to departure, you are entitled to a compensatory claim of between €250 and €600 per person, depending on the flight distance and the actual departure time or arrival time of the replacement flight. If your flight is brought forward, this is considered to be the same as a cancellation and as such you are entitled to claim a compensation. In general, the earlier the airline alerts you to your rearranged flight times, the more likely it is that the new schedule differs from the original flight without the airline having an obligation to compensate you. The price you paid for your ticket bares no relevance to your claims and passengers who travelled on package holidays are also able to claim. Cancellations: Ticket refund or replacement flight? Airlines are required to inform you of a cancelled flight as quickly as possible and must also offer you a replacement flight. Even if you are not entitled to compensation (eg the airline informed you more than 2 weeks earlier) they must also offer you a replacement flight or refund the full price of the ticket at the price at which it was bought. Flight cancellation as a business traveller? If you suffered a flight cancellation while travelling on business you’ll be the one who receives the compensation, not your employer. Likewise, if you’re travelling as a state official, the EU regulation states that you’ll be the one owed compensation from the airline. It is the individual passenger who endured the inconvenience of the delay who receives the benefit - not the person who paid for the ticket. This stands no matter the ticket price. Important: you can claim up to €600 in compensation, even if you have already been reimbursed for the price of your ticket. If the airline provides you with refreshment vouchers, this doesn’t alleviate their responsibility to issue your compensation. Are you currently affected by a flight cancellation and strike or bad weather conditions are not the cause? Find your cancelled flight in our table, check your entitlement for compensation in our claimcheck and let Flightright enforce your claim for you. How do I apply for compensation if my flight is cancelled? It is usually difficult for those who come from a non-legal background to determine whether or not they are eligible for compensation following the cancellation of their flight. This is where Flightright is able to assist you. As an expert in European air passenger law, we are able to verify the applicability of the European Regulation to your situation and to claim compensation on your behalf, even when faced with a lack of cooperation from the airline. Thanks to our free compensation calculator, you can easily verify that your case falls within the scope of the European Regulation. 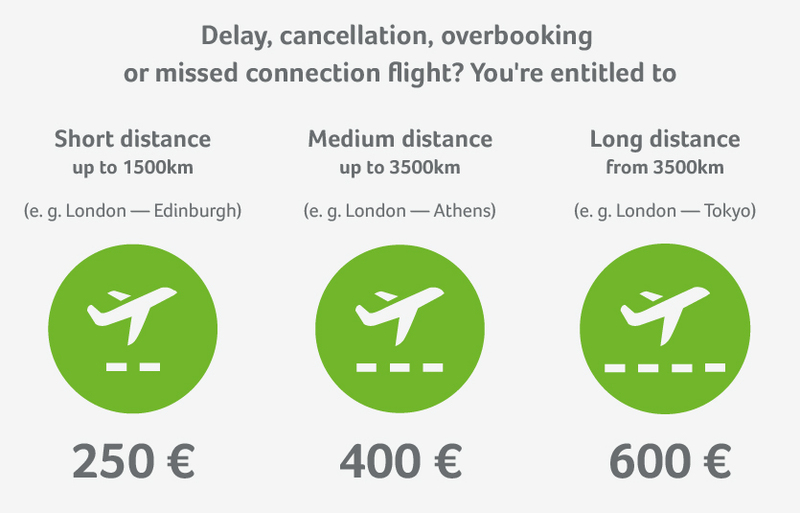 Simply enter your flight details and you will know the amount of your potential compensation within minutes. Already used by more than 3.2 million passengers, our claim check calculator is the first step towards ascertaining the compensation you’re owed. Should the claim check indicate that you are entitled to compensation for your cancelled flight, you can instruct us to start filing your claim straight away. By entrusting your case to us, you are partnering with a committed, knowledgeable and proactive partner: we offer passengers the best chance of being compensated and receiving the settlement amount. We’ll make sure that you get the compensation you’re entitled to, even if that means going to court. We currently have a 98% enforcement success rate, and we will bear all costs, and we will bear all costs if we are unable to enforce your rights. We only receive our success commission, 25% + VAT, if we win and are able to get you compensated. Take advantage of our many years of experience in Europe and our knowledge of air passenger rights to help you claim your compensation. What makes it so difficult for me to assert my rights myself? On a regular basis, airlines do not follow up on passengers' complaints and when they do, they opt to respond to them through standardised letters asking passengers with complaints to wait for a prolonged period of time. Another practice with some airlines is to offer discount coupons, which are often much lower in value than the owed compensation, claiming that this is what their passengers are entitled to. In reality, European rules on air passenger rights are not well known, and airlines do not always inform passengers of their rights. Without sound legal knowledge, passengers are often lost and do not know how or to whom to turn for help with claiming compensation. This is something that Flightright refuses to accept. Thanks to our experience and expertise at the European level, we know the subtleties and pitfalls to avoid in this matter, which makes us able to assist you in obtaining compensation for your flight cancellation. If you've experienced a lengthy waiting time at departure you're entitled to more than your potential compensation, regardless of whether the airline is responsible for the cancellation or not. Among other thing, the airline is required to provide its passengers with food and refreshments. Passengers are also entitled to 2 free phone calls or emails. These benefits must be offered regardless of the circumstances surrounding the cancellation - regardless of whether it’s a technical fault, bad weather or strike action. When your flight is rescheduled for a next-day departure, the company usually arranges your hotel accommodation and transportation to and from the hotel. The company should normally provide you with the necessary information, but it is recommended to obtain written confirmation from them. Finally, remember to check with the company before making a reservation by yourself. What are “extraordinary circumstances” in cases of flight cancellation? An exception is made if the airline could have prevented the problem. An example would be if the airline cited bad weather conditions, and what actually happened was the airline failed to ensure that there were sufficient supplies of de-icer before the onset of winter. In this case they may be deemed responsible for the delay - especially if flights operated by other airlines were able to depart on time. This is not something that passengers can often easily prove, though. Our experts carry out an accurate assessment by accessing specialized databases containing meteorological information on hundreds of thousands of flights. This data allows us to provide the necessary evidence to establish an airline's liability for cancelled or delayed flights.